Tickets are still on sale at The Garden , Ticketmaster , StubHub. ESPN3 and ESPN2 will present live the BNP Paribas Showdown 2013 from Madison Square Garden on Monday, March 4, with two star-studded matches: a US Open rematch between the world’s top two ranked players, Serena Williams and Victoria Azarenka followed by Rafael Nadal – who recently returned to action after being sidelined since Wimbledon last summer – facing former US Open champion Juan Martin Del Potro. ESPN holds exclusive live rights to the matches, and ESPN3 will begin at 7 p.m. ET with ESPN2 joining at 9 p.m. Chris Fowler will call the matches with Cliff Drysdale, Mary Joe Fernandez and Patrick McEnroe. The Nadal-Del Potro match will also be available on broadband in the U.S. in Spanish on ESPN Deportes +. Williams, holder of 15 major titles, regained the world’s top ranking after last week’s WTA event in Qatar, despite losing to Azarenka in the final 7-6 (6), 2-6, 6-3. Azarenka, winner of the last two Australian Open championships, is now ranked No. 2. The two return to New York, where Williams defeated Azarenka in last September’s thrilling three-set US Open final. Nadal, who counts seven French Open titles among his 11 major victories, recently returned to action after a seven-month hiatus because of injury. He recently reached the final of both singles and doubles in his first comeback event and is ranked No. 5 in the world. He has not competed in the U.S. since playing in Miami last March. Del Potro, the 2009 US Open champ, is currently ranked No. 7. The BNP Paribas Showdown from MSG will air live internationally on ESPN’s networks in more than 130 countries and over 47 million households throughout Latin America, the Caribbean, Canada, UK, Middle East, Africa and the Pacific Rim, including on ESPN Latin America in Del Potro’s home country of Argentina. In addition, ESPN’s broadband players in Latin America & the Caribbean (ESPN Play) and Australia & New Zealand (ESPN3) will also stream live simulcast coverage of this event. Tickets remain available for the BNP Paribas Showdown and can be purchased at the Madison Square Garden box office and all Ticketmaster outlets. The event is produced by StarGames and MSG Sports, and it takes place on Tennis Night in America as part of World Tennis Day. Youth participation events will be held around the world on March 4 in conjunction with the ITF and national governing bodies, including an extensive roster of events in the United States in partnership with the USTA. To find a participating location in the US, visit www.youthtennis.com. 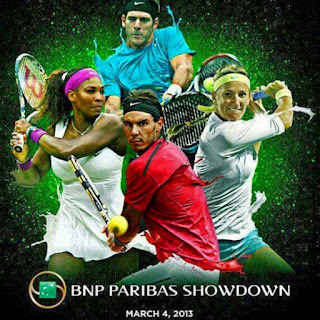 More information on the global events, including the BNP Paribas Showdown, can be found at www.WorldTennisDay.com. In addition to the BNP Paribas Open from New York on March 4, in March ESPN will present action from the BNP Paribas Open in Indian Wells, Calif., March 15 – 17, the Sony Open Tennis in Miami from March 27 – 29, and the WTA Family Circle Cup in Charleston, S.C. April 4-7. ESPN3, now in 83 million homes, carries every major global tennis event on the men’s and women’s circuit, including all four Grand Slam tournaments, every ATP World Tour 500 and ATP Masters 1000 event and WTA Premier events featuring all the top-seeded players. Also, ESPN Classic shows great matches from the past and the sport receives extensive coverage on SportsCenter, ESPNEWS, Spanish-language ESPN Deportes, ESPN Radio, ESPN.com andESPN The Magazine. ESPN 3D aired its first tennis at Wimbledon in 2011.